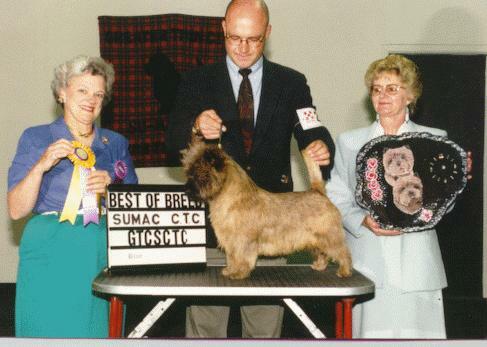 Riley finished his championship with a 5 point major and earning a CTCA Goblet by winning Winners Dog and Best of Winners, from the Bred By Exhibitor class under noted Cairn Breeder/Judge Lydia Hutchinson, at the Cairn Terrier Club of Southern California Specialty June 20, 1995 at 22 months old. He has also won a Best in Show and a Specialty Best of Breed and numerous Group placements, finishing out 1996 as the #2 Cairn Terrier in the US. He had proven himself as a sire, with many champion off-spring. If you are wondering about all the letters after his name; they stand for Canine Good Citizen and Temperament Tested. Riley was a natural hunter and was working on earning his Junior Earthdog title. Riley is GCL clear, vWD normal, hips and knees are x-rayed clear. You may also be interested to note that Riley's litter sister Rose Croft Party Shoes is the mother of our Super Star Teddy, Ch. Rose Croft Best Foot Forward.